Why I can't find my embedded form? I keep receiving email notifications that people are signing up for something. I have updated my form and embedded the new form on my sites. However I can't find where these notifications are coming from. How can I find out which website this jotform is, so that I can delete it and embed my new form? If I am understand you correctly, did you say that there is someone using your form? if so, please create a clone form and embed it to your site so you can prevent spamming on your form and that should help you to resolve the issue. 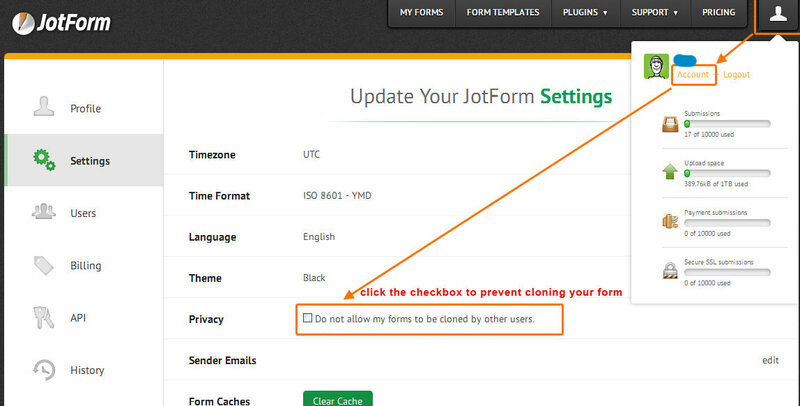 Then protect your form by cloning by other users, please check my screenshot below. I understand but my question is that I need to update my jotform but I can't find the site where it is embedded. I need a way to find the website where my jotform is located. How can I find the website? Can you please clarify to us what exactly was the problem? From what I understand on your last question, you are asking about the location of your website? Is this were you have embedded your jotform? Yes I have a few websites. When I create jotforms, I am able to embed the form on my sites. That is no problem. When I create a new form, for new purposes, I would like to delete the old form from my websites then I will embed the new form. I thought that I embedded all of my new forms correctly. I keep receiving email notifications that have a person's name and email address. It seems that someone who visited one of my sites, has signed up for something (an ebook, newsletter, etc). I have no idea where they are finding my jotform (in order to sign up). I have deleted all of my old jotforms for sign ups and embedded new ones that require more information from a website visitor. How can I find out which site or page this form is located? Should I just disable all the old forms on jotforms website? Will that delete any old forms from where-ever they are on sites? I hope that clarifies my request. I just need to know where visitors are entering their name and requesting information from me because I can't keep up. I'm sorry for trouble caused to you. Maybe you should try this widget on How to Know the Exact URL of a Page From Which a Submission Came, its very easy you need to put a hidden fields to your form so that you can detect where the submission came from. We're glad that the issue is resolved. Please contact us if you have any further assistance.